Using dynamic effects and other wizardry, Bethesda has somehow managed to cram the entire world of Skyrim into a relatively tiny package. Everything we seem to hear about Skyrim involves growth. Bigger maps, better graphics, meaningful NPC relationships, player housing, dragons that control time and swallow planets, you know, the standard stuff. For Bethesda, focusing on scale and growth is nothing new. The success of The Elder Scrolls has been built upon the backs of ginormous games famous for including things like huge tracts of land and shifting architectural styles. These aspects make for some impressive immersion, but including them comes with a price: Data, and lots of it. Too much data can, of course, lead to multiple game discs (see L.A. Noire earlier this year), yet somehow, perhaps by sacrificing a few mud crabs to a Daedric prince, Bethesda has seemingly ignored the laws of physics and managed to fit all of Skyrim onto one, count it, one DVD. Now, before you get all "this is how they did it with advanced data compression" on everyone in the forums, nerd, let's just take a moment to breathe in the sweet, sweet aroma of being able to place just one disc into our Xbox 360s and never need to leave our couches for anything other than fridge-runs and bathroom-breaks for sixty hours straight. Get a good whiff? Okay, onto the tech. 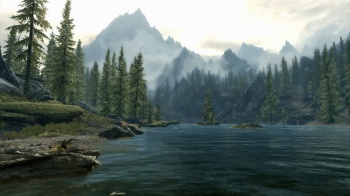 According to a previously leaked half-hour Skyrim walkthrough video, developers claimed they were able to handle the majority of Skyrim's environment utilizing "dynamic effects." Essentially, what this means is that whenever the sun sets during a rainstorm, allowing your argonian vampire to stalk the poor people of Dawnstar, the game applies these filters on the fly to already-produced textures as opposed to having the need for a second texture set for each condition (i.e. an argonian texture, a wet argonian texture, and a wet argonian in the dark texture are all simply "an argonian" with different filters that can apply to all other textures as well). That's impressive, Bethesda, but I'm still not sure I really understand how you can fit all of Skyrim in 8 gigs, or as I like to describe it, less than the size of my Bob Dylan .mp3 collection. The confirmation comes from Bethesda's art director Matt Carofano, who answered the question during a brief interview with ripten.com at this year's PAX Prime. Granted, Carofano isn't marketing or PR, so perhaps it's too soon to call this statement official. On the other hand, Carofano has been involved with the entire game's production, including the design of game cases and disc labels, so he probably has a pretty good idea of what's going on. There's still no word regarding the number of Skyrim discs you'll need to keep track of for PS3 or PC, but it's probably safe to say that if they got it down to just the one for the 360, they'll likely be doing the same for the others.